Yesterday we had a bank holiday in the UK which meant NO WORK for me :) Yay! I have been looking forward to this for-ever! (dash added for emphasis). As every year at this time, we went to England's largest medieval festival at Herstmonceux Castle for three days and had a blast. As I have so much I want to share with you, I will post several posts (can I say that?) about the weekend. First, let's start by giving you a general impression of the weekend itself. Herstmonceux is in south England, not too far from Brighton and Eastbourne for those of you who dont know. It is a Canadian international school and once a year they open up their grounds for the festival. The bf calls this the 'posh' festival as you dont have to camp since they also open up the dorms where you can sleep and it is walking distance from the beertent. Also v handy for the bf and great for me since I hate camping. I couldnt put up a tent to save my life! Today was an amazingly great day for creating :) Maybe that exhibition from yesterday really did do the trick! After days and days of contemplating on how to fix the skirt, today was decision-making day. After all, next weekend I wont be able to work on this outfit and after that I only have 2 more weekends. So time to get cracking. 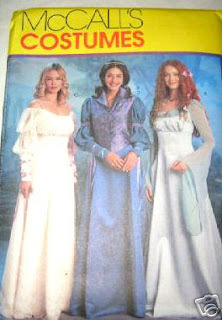 A long long time ago, I found an eBay seller who offered 50% off shipping from the US and I bought a number of patterns. I used the pattern for the jacket in the middle. Not very steampunky I know, but with the right tweaking not so bad. I didnt want to end up with a corset that would a) take forever to make, and b) be super uncomfortable. Someone I know from work works part-time with artists, and one of the artists he works with (Joana Vasconcelos) is currently showing an exhibition in London. I had been planning on going for a while now and last week's plans were cancelled but today was the day that we finally went. I even managed to convince the bf to come! Ok, one disastrous tube ride later (turned out I had lost my tube card somewhere so had to buy a new one) we both regretted leaving the house, but things quickly turned around at breakfast which we had at the Pain Quotidien in Notting Hill. There used to be only one branch, meaning hours of queuing, but luckily they have become a chain and are all across London. The best bread ever!! Really, if you're around you need to go check it out. After spending several hours of Gimore Girls yesterday, I actually finished another tiny part of the steampunk outfit today. I think I actually watched 20 hours of Gilmore Girls ;) With the bf away and my flu coming on slowly, it was the perfect recovery time of an awful week. The sewing didnt really happen this weekend, but I did manage to nearly complete my very steampunky guns :) I say nearl as I am considering re-applying some paint but so far am still only thinking about it. I made sure to take pics of the process (this was done over several days) to show you the difference properly. I bought these water pistols at the 99p store. Arent they super un-steampunky? They're black on the back as I nearly forgot to take a pic of the 'before' state and I had already dine the back. I had my heart set on the yellow one and thought that I could give the other one to the bf for his costume.